Ichiro Suzuki, or simply Ichiro, is one of the best pure hitters in the history of baseball. He turned a terrific career in Japanese baseball into a storied MLB career, becoming one of the most popular and successful Asian players of all-time. While most collectors are familiar with his American baseball cards, a whole different world of Ichiro card collecting exists in the form of products released in Japan, or cards that feature Japanese text. As impressive as his MLB career has been, Ichiro was hardly a rookie when he arrived in Seattle in 2001. 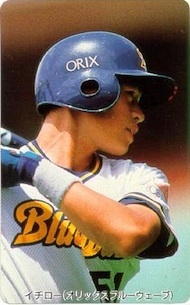 He spent nine seasons prior to his American arrival with the Orix BlueWave organization. 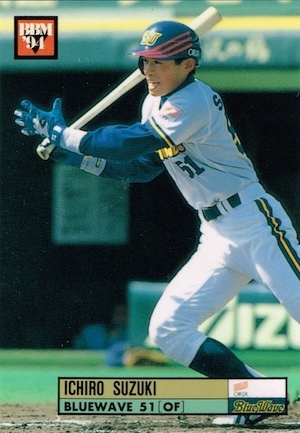 It was during this time that Ichiro began to build his reputation as a great hitter. It was not long before his image and name began to grace many things, including Japanese baseball cards. His first cards emerged in 1993, and these, along with cards from 1994 and 1995, are some of the most valuable cards issued from his career in Japan. Shop for Japanese Ichiro cards on eBay. The list below highlights some of Ichiro's best Japanese cards from the start of his career. Although by no means a comprehensive guide, the goal is to showcase the true trading card standouts as well as a few options across all budgets. When discussing Ichiro's earliest releases, it is important to note the relative rarity and reprint and counterfeit market. 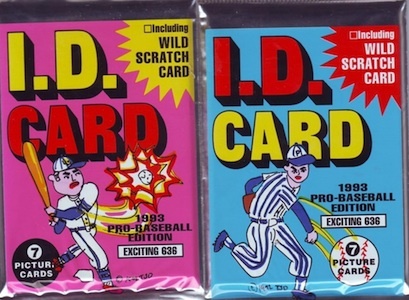 While the listings below will contain information about the potential for fakes, it would be beneficial to treat any Ichiro card from 1993 to 1995 with considerable scrutiny. For more information on his mainstream American cards, view our Ichiro profile or our list of the Top Ichiro Rookie Cards from his MLB days. Click on the listings or images below to shop for specific cards on eBay. 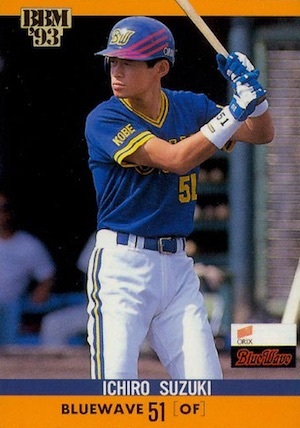 Ichiro's first card came from BBM and this is generally thought of as his true rookie card. BBM (Baseball Magazine) is a well-known card producer on the island of Japan, and the card front has a very American-ized look—similar to 1990 Pro Set—which may add to the appeal. The cards measure 2-3/8" x 3-3/8", making them slightly smaller than common U.S. baseball cards. 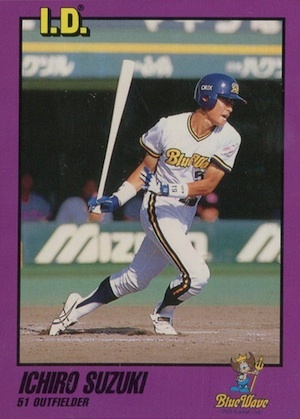 Found in complete sets as well as traditional boxes, it is worth noting that the first Japanese card for Hideki Matsui is also found in 1993 BBM. 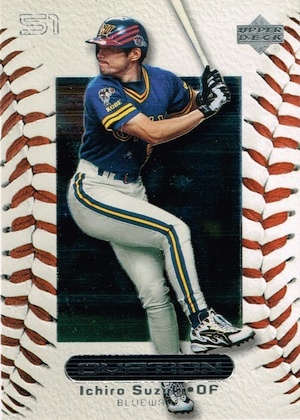 Because of the popularity and value associated with his key pre-rookie, fakes are a problem for the 1993 BBM Ichiro card. The differences are subtle and mostly deal with spotty print quality, especially when magnified. Also, the text used on the bottom of the card can be a giveaway, as the fakes tend to have slightly more-rounded letters. One thing to look for is the placement of the name in relation to Ichiro's leg. While the authentic card below has "Suzuki" end more toward the middle of the leg, some fakes line the final "i" up with the end of his leg. 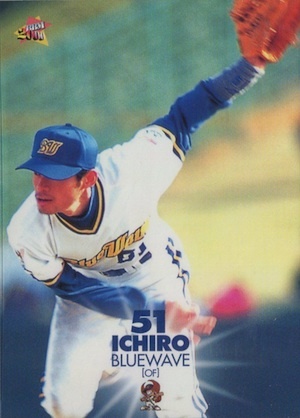 The 1993 Takara Orix BlueWave Ichiro card was a part of the 30-card team set. 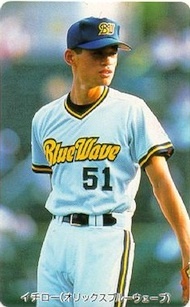 Ichiro's card is number 51, in reference to his jersey number. Because of this, the set is skip-numbered and starts with #0 and goes up to #52. Continuing a trend that will be seen throughout the list of Ichiro cards, the Takara cards are more narrow than traditional cards, with measurements of 2-1/8" x 3-3/8", and also feature rounded corners. The Takara team sets come sealed in plastic and housed in a cardboard box. The set is technically marketed as a baseball card game, reminiscent of Strat-O-Matic, but it is viewed by most collectors as a legitimate card brand. It can be difficult to see from the images, but the cards have five small perforations from the printing process. There is one remnant on each side of the card and two on the right. 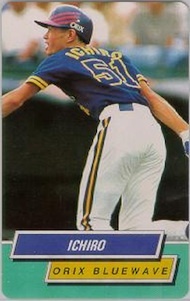 The last of the 1993 Ichiro Japanese cards, Tomy I.D. was another card manufacturer in Japan at this time, but were not nearly as popular as BBM. The design is more amateur, with a bright purple border and yellow logo. Unlike BBM, the 1993 Tomy I.D. 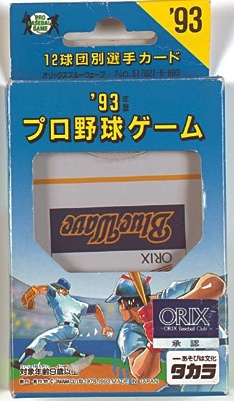 cards are the standard size, and were among the first Japanese brands to adopt the 2-1/2" x 3-1/2" format. This set also includes the Japanese rookie card for Hideki Matsui. Counterfeits do not appear to be as big of an issue with 1993 Tomy I.D., but it is good to know that there were multiple printings. If you look at the bottom right corner on the back of the card, some versions read I.D. 69-001 and some read I.D. 69-002. While both are rare, the first series is much more common. Tomy would release one more I.D. product in 1994 before abandoning their card production. Unlike the brands above, Calbee is primarily a popular Japanese snack food brand. However, their tradition of attaching individual baseball cards to food packages endeared them to collectors and touched on the nostalgia of the early years for baseball cards in the United States. Another plus for collectors, Calbee has been one of the most consistent Japanese baseball card producers since 1973. The cards first appeared with "Sapporo Potato" snacks but were transitioned to potato chips in 1980. Calbee celebrated their 40th anniversary for baseball cards in 2012, and have sold over one billion cards, one at a time. 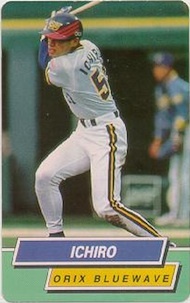 Still an unknown player at the time, Ichiro was not included in the 1993 release. 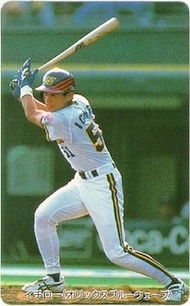 In fact, he was only included in the 1994 Calbee set as a regional addition. 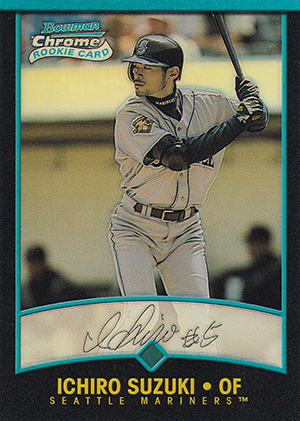 While the limited print run has not been revealed, it is easily one of the most scarce Japanese Ichiro cards. The three consecutively-numbered cards (#37-39) for Ichrio were part of a 39-card regional set and were reportedly available for just a few weeks. 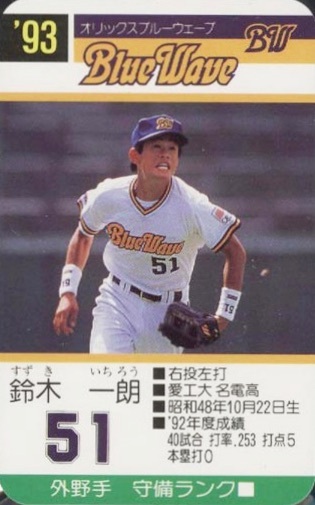 Counterfeits are a huge problem for the 1994 Calbee Ichiro cards. Given how rare they are, be very careful with any cards that are not certified authentic by a reputable grading company. 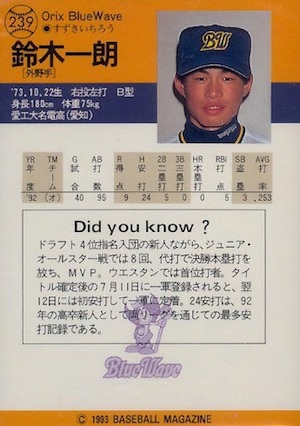 Also, reprints of card #37 were issued by Calbee in 2001. Not as popular as the inaugural BBM card, the second card from Baseball Magazine offers collectors a budget option if they cannot find or afford the 1993 card. There is also an All-Star insert (#A42) from the same year, and it is one of the first cards to list his name as just Ichiro. 1994 marked the year that Ichiro became a household name in Japan. After several years of waiting, Calbee finally included Ichiro in their regular baseball card release. Card #34 and #35 were part of the first series and are the most common of the group. The last two cards, #153 and #154, were included in Series 2. 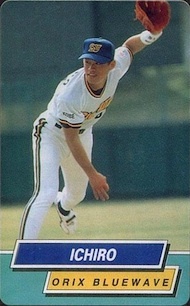 These final two Calbee Ichiro cards from 1995 were greatly under-produced given that they accompanied bags of potato chips and the second release coincided with a potato famine in Japan. 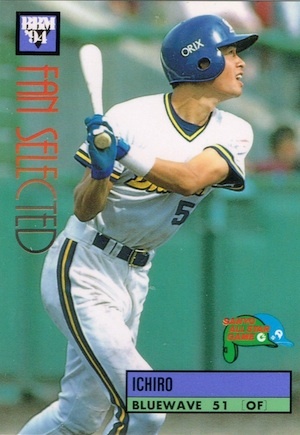 Technically not a Japanese release, nor does it feature Japanese text, the UD Collector's Choice card for Ichiro has an interesting backstory that ties it to Ichiro's pre-MLB career. In November of 1994, the NBA opened the 1994-95 regular season in Yokohama, Japan. On two consecutive nights, the Los Angeles Clippers played the Portland Trail Blazers, with the Clippers losing both games. Already a star in Japan, but little-known elsewhere, Ichiro was a VIP for the games. 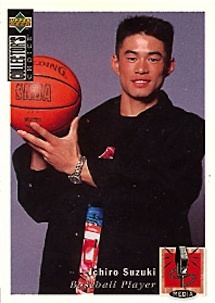 While in attendance, Ichiro crossed paths with an Upper Deck representative and shot a few photos holding a basketball, which were turned into a media card. While the total amount printed varies by the source, it is estimated that only 100-200 cards were made and delivered to Ichiro and none of the cards were included in packs. Very few have surfaced, but when they do, they have been greeted with four-figure sales. As one of the last Japanese-issued cards from Ichiro's active playing days, the 2000 BBM card holds more historical significance than actual value. Regardless, it is a great budget card and the colorful image gives it a unique look. Additionally, there is a basic "Preview" version of the card that is noted as such on the right side of the card, and also a silver facsimile signature "Preview" version. Both versions are listed as #P30 on the back, instead of #326. The new millennium saw two Japanese-issued products from Upper Deck, marking the first commercial Ichiro cards made by a major USA card company. These products included 2000 UD Ovation and 2000 UD Ultimate Victory. Ovation is the more popular of the two based on its premium design and limited print run. Intended to look and feel like a baseball, the base set consists of 60 cards, starting with #31. The first 30 cards feature "Rising Stars" and a different design. The "Rising Stars" cards are numbered to 2,000. This Ichiro card remains very affordable. 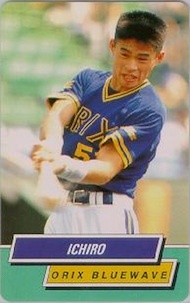 Perhaps the most famous Japanese Ichiro card, 2001 Bowman Chrome included both Japanese and English versions. 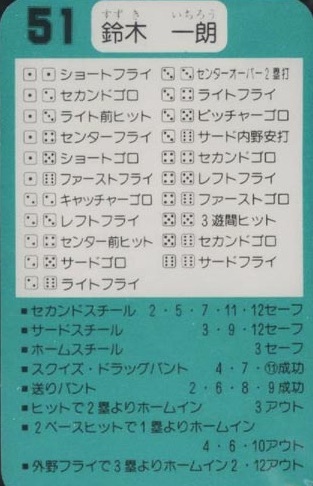 While it is not a Japanese release, the variation lists all information entirely in Japanese on the back. Both versions came as redemptions that specified English or Japanese, and are long expired. Therefore, collectors who are trying to obtain these cards should be aware that they will not pull live cards from boxes, only expired redemptions. In addition to the base Refractor cards, there are also X-Fractor and Gold Refractor parallels. The Gold Refractor editions are numbered to 99, but the first 49 (#1/99 - #49/99) consist of only the Japanese version, and the final 50 cards (#50/99 to #99/99) are reserved for the English version. When shopping for Ichiro's Bowman Chrome rookie cards, it is good to know that Topps issued Throwbacks reprints of both the English and Japanese versions in 2011 Bowman Chrome. The cards are listed as "REPRINT" on the back of the card, near the Bowman Chrome logo. 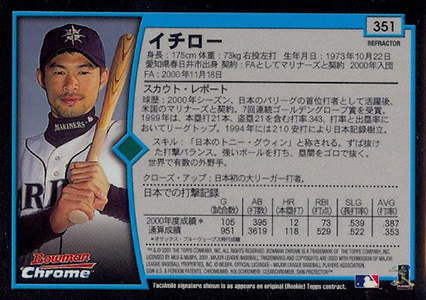 There is also a 2001 Topps Gallery variant rookie card for Ichiro with Japanese text. 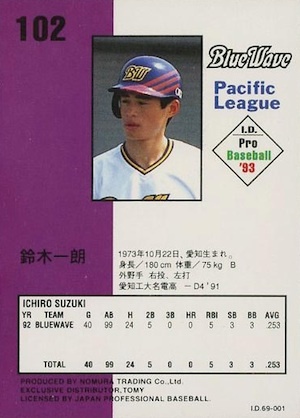 *Rare* 1995 Ichiro Suzuki Orix telephone card unused item 1995 rare card Mint!! 2000 Ichiro Suzuki Gem Mint 10 Upper Deck Ovation Blue Wave Japanese Card Rare!